"Real love is demanding. I would fail in my mission if I did not clearly tell you so. For it was Jesus--our Jesus himself--who said, 'You are my friends if you do what I command you' (JN 15:14). Love demands effort and a personal commitment to the will of God. It means discipline and sacrifice, but it also means joy and human fulfillment." The words above were spoken by Pope John Paul II on his visit to Boston in 1979. It is a homily to which I often make reference. In some way or another, though too young to understand it at the time, the homily (and the Gospel of the Rich Young Man upon which the homily was based) has served as a foundational moment of my own Christian life. "Real love is demanding." I suppose one of the things that I loved and admired about John Paul II was that he was unafraid to preach the demands of the Gospel. In front of the youth of America, John Paul II didn't attempt to make the Gospel more palatable by watering it down. 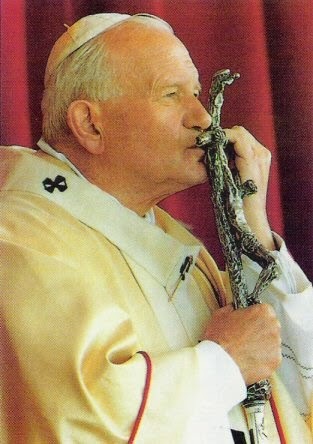 John Paul II trusted that the words of the Gospel have power to move and to save. He proposed to young people the option for Christ and his way of life. But, he didn't want to pull a fast one. He didn't want to offer something that was a little less demanding--a little less total--in the hopes that he'd get a better response. He put in front of the youth of America the same option that was placed before the young man in the Gospel. "Give everything and follow Christ." Although the pages of the Gospel are filled with difficult challenges, none are more so than the words found in the Fifth Chapter of the Gospel of St. Matthew. "But I say to you, love your enemies, and pray for those who persecute you." These must be the most demanding words of the entire Gospel. These words never seemed particularly challenging to me because I've never really had the experience of having enemies. In parish life, although there were disagreements about certain projects or ideas, I never had the experience of thinking those who disagreed with me were my enemies. We were in communion of mind and heart despite whatever disagreements came along the way. So, the idea of having an enemy has always been a theoretical possibility to me and not an experiential reality. In a way, I was kind of off the hook when it came to loving and praying for enemies because I never considered myself to have any. Somewhere along the way, however, I apparently made an enemy or two. And now, the words of Matthew Five are no longer a theoretical "just in case this ever happens" instruction, but a real confrontation with the demands of Christ. When somebody attacks us in a deliberate and vicious manner, it is not our natural inclination to love and to pray for him. But then, in front of us stands Jesus and he is saying, "But I say to you love your enemies and pray for those who persecute you." Since becoming Pope, Francis has talked a lot about mercy and the forgiveness of enemies. Something tells me that all of his talk on this topic is not theoretical, but has arisen out of some profoundly painful experience in his own life. The way he speaks about mercy and forgiveness suggests to me that he's had enemies along the way and has fought the good fight of loving and praying for them. In this way, I see something similar between the preaching of John Paul II and Francis. Each, in his own way, is saying, "Real love is demanding." I've discovered that following the program of the Pope doesn't necessarily bring with it a lot of benefits! When young priests began teaching and preaching on the Magisterium of John Paul II, they were met with immediate suspicion. When priests obeyed Pope Benedict and sought to follow his lead on the Sacred Liturgy, they were opposed. The New Evangelization comes with a cost. Having encountered the Cross that comes from preaching the Gospel and from following the lead of the popes, I have stumbled right into this "Love your enemies and pray for those who persecute you," line. In front of this passage, and in front of a new pope who is constantly speaking about the need to love our enemies, there arises a great temptation to take the path of those who are enemies of the Cross--to find a loophole, to water down the demand, to find a justification for not obeying it. In front of these words of Christ, there arises a profound question, "Do I really have Faith?" Loving our enemies and praying for them brings no immediate and satisfactory resolution to our desire for justice. It is to say, "I'm doing this Lord only because you have commanded me to do it." It is similar to the situation of the Rich Young Man. Christ gave him a command: "Trust me, leave everything, and follow me." Most of the students here at the University have gone away this week for Spring Break. Each day during break, I've come to chapel and have had Mass and a Holy Hour with a couple of the students. As I look at these young people and their witness to Christ at work in their life, I am encouraged to follow Christ. I need witnesses in my life who show me that Christ is true and that his words are trustworthy. Simply seeing these young people pray is a source of encouragement to me. In living Lent this year, I find myself--like the Rich Young Man--kneeling before Christ with his gaze upon me. And I can clearly hear the great voice of John Paul II: "Real love is demanding." Our Bible Study group is reading John this session. Thank you so much for what you have added to my understanding - especially v15. Shared your post with those who were not subscribed and they were most grateful.